Hands-down, there is nothing better than a Bachelorette Party Weekend in Virginia Wine Country. We can attest to this well-known fact because we hosted over 30 bachelorette weekends in 2018 and we loved every single one of them! The Orchard House Bed and Breakfast has the perfect set up for such a memorable and important event. First, we require that our bachelorettes rent one or the other of our two houses. This is perfect for both the privacy of our bachelorettes, and the comfort of our other guests. Secondly, we offer customized Wine Tours as part of our “Bachelorette Weekend” package. Our tours depart after breakfast, before 11am, and return around 4pm. Within that time frame our bachelorettes can visit a combination of wineries, breweries, distilleries, and cideries. Our Wine Tours include a professionally packed picnic lunch served at one of the most spectacular local vineyards imagineable. A close second to our wine tours would be our spa experiences. Massages, facials, or a combination of the two are offered by our local spa team and conducted here in our newly renovated barn. Many of our bachelorette groups have requested spa treatments on their first night, and the wine-lovers package on their first full day. What a perfect combination! Finally: our property. 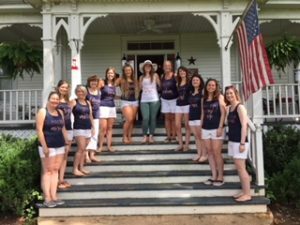 As guests at the Orchard House Bed and Breakfast, our bacheloettes have full access to our 14 acres. This includes our new inground salt-water swimming pool, our new gas fire pit which overlooks the mountains (and starry skies that are unlike anything you’ve seen! ), our one-acre vineyard, and a one-mile hiking trail. Our multi-course breakfast is served each morning of your stay, and we make sure that your group has a private table so you can reminisce and giggle about the night before! We absolutely love our Orchard House Bed and Breakfast Bachelorette Weekends. There is a fun energy on our property, we love pampering our girls and helping them plan a perfect-for-them weekend. We also have witnessed firsthand how our property provides the best experience no matter how they choose to spend their weekend. As a side-note, one of the most amazingly unexpected things we’ve witnessed is our bachelorettes returning quickly with their significant others for their own weekend getaway. We love that! We’d be honored to help you plan the perfect celebration for your girls! © The Orchard House. Site Design by Wagner Media Works.